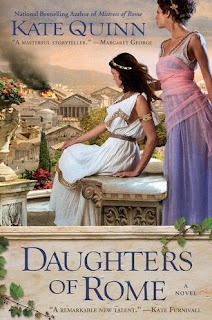 I am very honored to have had the opportunity to interview one of my favorite new historical fiction authors, Kate Quinn, author of the new release Daughters of Rome . Having thoroughly enjoyed both of her novels I am very excited to have her here and to be hosting a giveaway for 1 copy of Daughters of Rome . What inspired you to write Daughters of Rome ? As soon as I read about that turbulent period of Roman history known as the Year of Four Emperors, I knew I had to write a book about it. It’s the name that grabbed me - like the War of the Roses or the War of Jenkins’ Ear, it’s an instantly fascinating combination of words to any bored history student looking desperately for passion and bloodshed between all the dry lists of dates and treaties. And the Year of Four Emperors has such an extraordinary cast of characters; not even Hollywood could have cast four more different men to wear the same crown: a bad-tempered old crank, a metrosexual party boy, a fat ex-jock, and a genial Everyman. Who could resist? All I had to do was plop four girls down in all the chaos with the four Emperors, and stir to a boil for a hell of a ride. Daughters of Rome is your second book set in ancient Rome, what is it about this time period and place that draws you to write about it? What I love about ancient Rome is how relatable it is to the 21st century. Sure, some things about their society make us blink – gladiatorial shows, slavery, all-powerful emperors. But so much of their culture was far advanced for its time; a modern girl plunked down in 1st century Rome would find running water, bikini waxes, birth control, no-fault divorce, wine bars, sports fans, religious freedom . . . many things that for the most part disappeared in later centuries and weren’t seen again until far more modern days. And Roman women struggled with so many of the same problems modern women do. One of my heroines in “Daughters of Rome” has two marriages end in divorce – a process just as depressing whether it involves a team of expensive lawyers (the modern way) or simply moving out of the house (the Roman way). Another of my heroines is confronted with an unplanned pregnancy; just like any modern girl, she faces the agonizing choice of “adoption, abortion, or motherhood?” And a passionate affair with the wrong man is just as confusing and heartbreaking whether the man in question is a 21st century ex-boyfriend with commitment issues, or a handsome slave from 1st century Gaul. Roman women and modern women, I think, would understand each other very well in lots of ways. What kind of research went behind the writing of Daughters of Rome ? I read Gwyn Morgan’s non-fiction book “69 A.D: The Year of Four Emperors” to tatters – I carried it around like a security blanket until I had whole chapters memorized. Original sources like Tacitus and Suetonius were also a big help. And I’d have been lost without Wikipedia, which is one of the greatest tools for a writer ever made. How do you feel your writing has evolved since your first book? I’m not sure it’s all that different, because I was working on both books at the same time. I was halfway done with “Daughters of Rome ” when “Mistress of Rome ” was picked up for publication, so I had to drop my work in progress and dive back to an earlier book in order to meet the deadline. As soon as MoR was completed, I went straight back and finished up DoR. Definitely a screwy way to write a prequel-and-sequel. Next time I’ll plan things a bit better! Daughters of Rome takes place in the time period called the Year of the Four Emperors. Can you tell us a little about this period in Rome's history and how it affected the people of Rome? It was the period just after Nero died, when the throne changed hands four times in one year. It was a very uneasy time for the people of Rome, just struggling to keep up with the shifts in power. You might fare badly under one emperor, see your fortunes rise with the next emperor, then lose it all for supporting him by the time the third emperor rolled around. By the end of the year the city was literally being torn apart, with two different claimants and their soldiers fighting battles in the streets, and Roman citizens watching fearfully from the sidelines. It all ended in peace, with an emperor who kept things stable for the next ten years, but no one ever felt quite secure about the transfer of power again. This was the year that proved you didn’t need legality to become Emperor of Rome – all you needed was an army. That was the fatal flaw that would eventually bring the whole empire down, hundreds of years further along the line – and it all started with the Year of Four Emperors. Oooh, what a good question. “Gone With the Wind ,” maybe, or Anya Seton’s “Katherine,” or Pauline Gedge’s “The Eagle and the Raven ” – one of those big juicy historicals that grabbed me by the throat and transported me to another world so thoroughly on first reading that I didn’t come down to earth for days. Or maybe Shakespeare’s “Henry V ” – I’d love to read the St. Crispin’s Day speech and get chills all over the way I did the first time through. Judith Merkle Riley taught me that it’s okay for historical fiction to be funny. Eva Ibbotson showed me how to humanize a hero or heroine with human quirks, and how to surround them with a fantastic array of secondary characters. Pauline Gedge showed me how to write strong compelling heroines, and C.S. Forester brought home the importance of having an absolute hunk of a hero. Lastly, my signature question - Do you have any advice for aspiring authors? One word: read. Writers can’t exist in a vacuum; you have to keep feeding your brain with other books so you have something to measure your own work against. Read classics and try to figure out why they’ve stood the test of time; read trash to figure out why it’s terrible; read bestsellers to figure out why they sell. Read books you love, and then read romances or fantasy or sci-fi even though you hate those genres, just to figure out what makes you hate them. Read everything. Thanks so much for having me! Thank you so much Kate for stopping by, it was a pleasure having you!! And thank you for the recommendation, I immediately added The Eagle and The Raven to my wishlist! 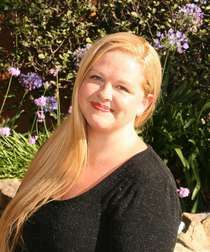 For more information, please visit Kate Quinn's WEBSITE. - Giveaway ends on April 18th. Thanks for the opportunity...would love to win this book. I don't know much about Roman culture or history so I would love to give this a try! Thanks for the giveaway! I haven't really read any stories from that period. I would love to read this book. Thanks for hosting! I also loved Mistress of Rome so can't wait to get my hands on this book! This sounds great. Historical fiction is my favorite! ReadHandedLibrarian at gmail dot com. I loved Mistress of Rome and can't wait to read Daughters of Rome! I'm fascinated with Ancient Rome so this book sounds right down my alley. I also added The Eagle and The Raven, which looks like another really good book. Just walking around the ruins of Rome, one can only imagine the people who walked there long ago and wonder what their lives were like. Fascinating period in history. I do so hope to be selected to win a copy of this intriguing novel. I'm fascinated to learn of the year of four emporors, and I loved the answer to the question about writing influences. I love novels with a sense of humor, characters with human quirks, great secondary characters, and "an absolute hunk of a hero." I'm reading and reviewing her book, Mistress of Rome later this month as part of my Italy Tour! I thoroughly enjoyed the last book the Mistress of Rome and have no doubt that this new book about the time right after Emperor Nero, the year of the 4 emperors will be wonderful. Thanks for this great giveaway. I shared about the book on my facebook page. I've always been interested in the Roman times. Thanks! I have Ms. Quinn's first book in my TBR pile and would love to add this one as well. Please include me, this sounds like a wonderful read! I enjoy stories about Rome. This one sounds like another great one. Oh boy, now I want to read both books. Do you remember 'I, Claudias' on PBS a long ago. That ols show makes me really want to read both books. Roman history is exciting!!! This sounds like a wonderful read. Thanks for the chance to win. Oh I would LOVE to win! I'm so enfatuated with Rome! Thanks for the giveaway. I absolutely LOVED Mistress of Rome and would love a chance to win a copy of Daughters of Rome. I am already waiting to hear about when to hopefully expect a sequel to Mistress of Rome, I just can't get enough! Thanks! Just added this giveaway to my sidebar. Wow, what lovely comments! Amy, you have such nice followers. Thanks to everybody who entered to win "Daughters of Rome" - and for Michelle, I can tell you that the sequel to "Mistress of Rome" will be released right around this time in 2012. Tentatively it's been titled "Empress of the Seven Hills." Had to jump over to Amazon to check on THE EAGLE AND THE RAVEN. It is now on my wish list. Sounds good. I have read few stories that were set in Ancient Rome. I know a bit about the society, but the history is another story. I had not heard of the Year of the Four Emperors. It is easy to imagine the instability this would cause. Sounds like another great story. Tweeted the giveaway as pbbearclaw at 12:37 AM on 4/8. Shared the giveaway on Facebook as Patricia Barraclough at 12:39 AM on 4/8. Great Interview... I've been waiting for this book after I finished 'Mistress of Rome' Quinn is a wonderful writer. What a fabulous cover! this book sounds interesting. I love how she relates their problems to our modern day ones! I would love to read your book ! I love Roman history and would love to win this one. Thanks for this great giveaway! Like many, I love reading about Ancient Rome. I will definitely check out this book. I love books about the Roman Empire, and this one sounds really good. Would enjoy reading it. Please enter me. Thanks! I have this on my list. Please enter my name for the drawing. Will definitely add this to my TBR-ASAP list. I love historical fiction. I enjoy reading author interviews because it is interesting learning about the person behind the books they create! Rome...the beginnings of our civilization, and sounds like a cautionary tale of politics! Will post to fb for ongoing feeds of historical fiction notices. Great interview! Kate is such an interesting and entertaining person. Thanks for the giveaway! I tweeted and facebooked this giveaway. This looks like an excellent book! Thanks for hosting the giveaway.